Every summer in Central Park, people gather to participate in the Achilles Hope & Possibility run. Spectators enjoying the four-mile race watch runners with prosthetic legs, people using wheelchairs, handcycle bikes, and able-bodied runners running side by side with one another. Among those runners is Susan Constantino. And although she doesn’t have a disability, the race provides a glimpse of the future Constantino would like to see for people with disabilities. The event, hosted by Achilles International, is meant to “enable people with all types of disabilities to participate in mainstream running events in order to promote personal achievement,” the organization’s website says. But this race isn’t the first time Constantino had been exposed to people living with disabilities. In fact, she has been fighting for disability rights and equality for nearly five decades. Early in her career, Constantino pursued a path as a special education teacher, and eventually she became the director of an education program for children with disabilities in Buffalo, New York. Although she enjoyed the work, she quickly noticed how her students were treated differently from the able-bodied students. “It occurred to me that the children were basically in a separate school; they weren’t getting the same opportunities; they weren’t going to preschool with kids without disabilities, and there was no particular reason why. It was just happening,” Constantino says. Fortunately, she says, the time was right for a change. In the late ’80s, Apple computers were just getting introduced into the public school system, and Constantino immediately saw how the technology could revolutionize education for students with disabilities. As a result of the program’s success at her school, Constantino and her team wrote a grant to the federal government for funding of a program called, “Special Friends and Computers.” The initiative’s goals were to give students with disabilities computers, which would give them the resources necessary to join their able-bodied peers in mainstream classes. The government approved the grant for three years. After that, the government approved the grant for six more years, along with funding to train teachers across the country to begin incorporating more integrated educational opportunities for kids with disabilities. “You could see that if you can adapt materials to give our kids opportunities to participate, the other children would discover what good friends they are. That’s why Special Friends was successful,” she says. Constantino has since moved on from her days as a public educator, but her advocacy for disability rights hasn’t waned. 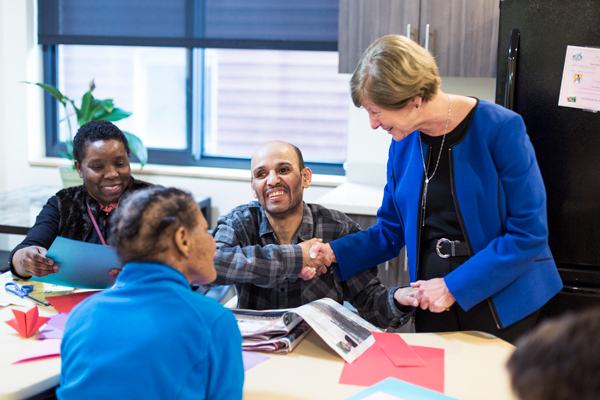 Now, as president and CEO of Cerebral Palsy Associations of New York State, Constantino fights daily to earn equal access to housing, transportation, and medical care for individuals with disabilities throughout the state. The organization is a direct service provider for individuals in New York with a wide range of physical and developmental disabilities, including conditions such as cerebral palsy and autism. The organization’s goal is to help people with disabilities lead fulfilling, independent lives. To accomplish that mission, it offers a variety of programs aimed at giving people with disabilities the resources they need to thrive on their own. CP of NYS also advocates for individuals throughout the state through its network of twenty-five affiliates. One of the biggest obstacles to independence for this group of people is a lack of accessible housing, Constantino says. 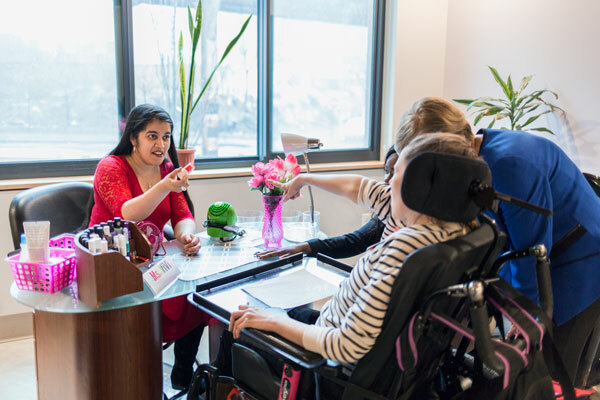 Even in New York City, which she considers to be a relatively accessible city, it can be difficult to find an apartment building without stairs or an affordable space large enough to fit wheelchairs or other medical equipment. Even in buildings with an elevator, folks with disabilities face significant challenges when equipment fails. To combat this, CP of NYS provides several housing options for individuals as a welcome alternative to life in a nursing home or other care institution, Constantino says. 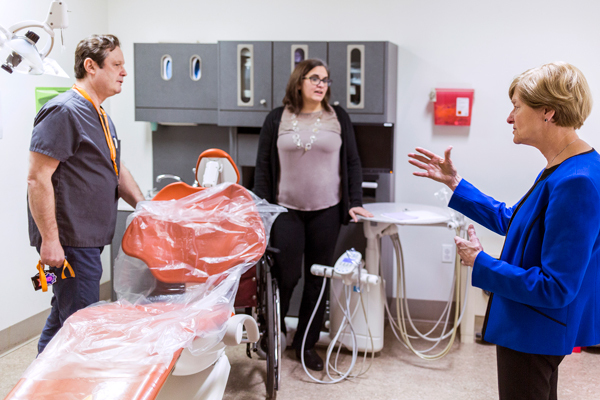 For individuals who require some assistance before moving to one of these spaces, the organization offers classes on skills such as cooking and cleaning so they are prepared to take care of their health and hygiene once they move. And depending on a person’s needs, the organization also offers a wide spectrum of support, from twenty-four-hour aid to assisting individuals on an as-needed basis, she says. Constantino and the organization have helped more than five hundred people move into in these accommodations throughout New York City, with varying degrees of supervision. In upstate New York, Constantino and the organization’s affiliates have built hundreds of one-story homes for people that are spacious enough to meet any individual’s accessibility requirements. But accessible housing is just one barrier that people with disabilities face. Although transportation in New York City is relatively accessible, it’s difficult for individuals living in more suburban or rural areas to access transportation, Constantino says. And, the services that are available for these individuals to use are often cost-prohibitive. Constantino also points out that for people who use wheelchairs, it’s difficult and expensive to repair the chairs when they break down, which can leave people immobile for days, or even weeks. To alleviate some of this burden, CP of NYS has partnered with its own transportation company in the five boroughs of New York City and has worked with other companies to offer affordable door-to-door busing services for individuals without access to an accessible form of transportation. But even if some disabled people can find accessible housing and affordable transportation, often one significant challenge remains: access to medical care. In addition to that challenge, some clinics aren’t handicap accessible, and some healthcare providers don’t accept Medicare or Medicaid insurance coverage, which many people with disabilities use to access medical care. But Constantino hasn’t let that stop her from providing access to these services for CP of NYS’ clients. Constantino has spearheaded the opening of five federally qualified health clinics, called Metro Community Health Centers, throughout New York City, with two more on the way, staffed with medical professionals trained to handle a wide variety of medical concerns and to accommodate a person’s needs for receiving proper care. Every building is also fully wheelchair accessible, offers behavioral health services, and dental or oral health services. She has also led the effort to introduce telemedicine into these clinics, so individuals may see a doctor without leaving their homes. 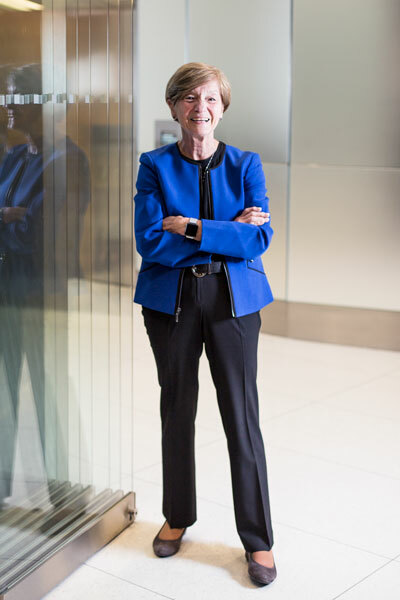 Her decades of work have pushed Constantino closer to the future she envisions while she runs the race through Central Park every year. But she isn’t satisfied with the status quo, and she is passionate about continuing to chip away at the inequalities people with disabilities still face.